In a skillet, melt 2 tablespoons of the butter and gently cook the garlic over medium heat, taking care not to let it turn brown. After 3 or 4 minutes, scrape the garlic and butter into a mixing bowl using a rubber spatula. Add the eggs, milk, cream, paprika or pimenton, salt, and pepper and beat until well combined. Fold in the cheese and parsley until well combined. Use the last teaspoon of butter to grease the bottom and sides of a large lasagne dish. Pour the cheese custard mixture into the greased pan. Preheat your oven to 300°F (150°C) and boil a kettle of water. Place a lasagne pan in a larger roasting pan and set on the middle rack of the oven. Pour the hot water into the roasting pan until it comes halfway up the sides of the lasagne pan. Bake the custard for about 40 minutes or until it is just set in the middle. Remove from the oven and allow to cool on the counter before attempting to cut into the flan. Toss the sweet potatoes and corn kernels in a bowl with 2 tablespoons of olive oil, the chili powder, cumin, and cayenne pepper and mix well. Pour onto a baking sheet lined with parchment paper and spread it around so it forms a single layer in the tray. Bake until soft and slightly golden on the edges, or about 17 to 20 minutes. Open the oven door after 12 minutes and stir the vegetables around a bit so they cook evenly. When ready, scrape them into a mixing bowl. Finely chop the roasted pepper and add it to the sweet potato and corn. Then add the cilantro, vinegar, lime juice, salt and pepper, and a couple more tablespoons of olive oil. Mix well and adjust the seasonings if desired. Just prior to serving, pre-heat your oven to broil. Cut the cooled egg flan (still at room temperature) into rectangular pieces that will roughly match the length of the sliced baguette but be about 2/3 the width. Slice the chorizo sausages on a slight bias and quite thinly, approximately 1/8th inch thick or less. Heat a non-stick sauté pan and sauté the sausages in the oil for a few minutes to warm through. The paprika inside will colour the oil in the pan as they cook. When warmed through, turn off the heat and set aside. Lay the slices of baguette onto a baking tray and toast on one side under the broiler. Place 2 or 3 slices of warmed chorizo on top of the bread in a single layer, overlapping slightly. Place a piece of cheese flan on top of the sausage and garnish the flan with about half a teaspoon of the salsa. Garnish, if desired, with a sprig of cilantro or some chopped parsley or chives. 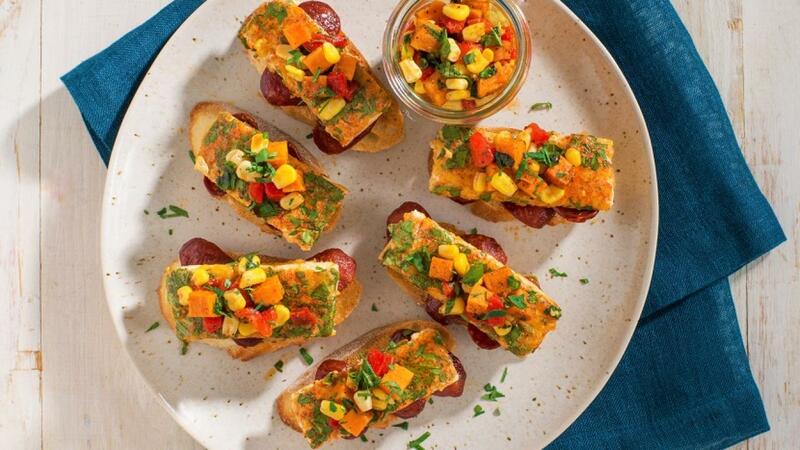 These hors d’oeuvres can be served at room temperature, as you would Spanish tapas.